In the volcanic pit-crater of Brothers’ upper cone, 1200m beneath the waves, our survey camera caught something rare and spectacular! 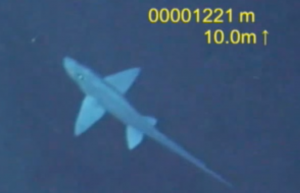 A ghost shark (Hydrolagus), slowly drifting about its home in the deep! I spoke to Andrew Stewart, an expert on New Zealand’s fish and a natural history collections manager at the Museum of New Zealand Te Papa Tongarewa. He had plenty to tell me about this beautiful and elusive creature! See the footage and learn all about it below!